KATHMANDU: The main group of Nepal’s Maoist former rebels and the liberal Communist UML party merged on Thursday to form the Himalayan republic’s biggest left party in a move likely to upset southern neighbor India but have China rejoicing. Officials said the two constituents of the ruling coalition had formed the Nepal Communist Party, which now heads the nation’s first majority government in 19 years. In last year’s general elections, the two parties had formed a rare electoral alliance, defeating the centrist pro-India Nepali Congress party. The two have now come together to form the Nepal Communist Party which is considered to be closer to China and controls 174 seats in the 275 member parliament. Nepal, a natural buffer between China and India, had ten government changes after the abolition of monarchy in 2008. Fickle coalitions retarded growth and slowed reconstruction after a devastating earthquake killed 9,000 people in 2015. Nepal’s Prime Minister, K.P. 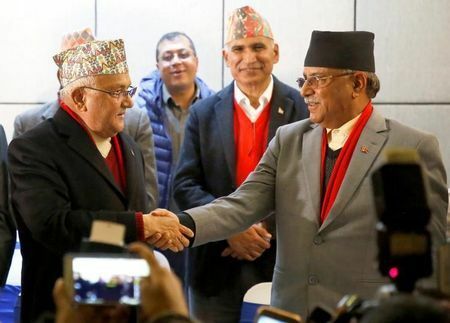 Sharma Oli, who is also the UML chief and Maoist supremo, Prachanda, who led a decade-long armed conflict against state forces, will co-chair the new group until political delegates elect a new leader in two years, party officials said. “We are committted to … economic prosperity with social justice,” Prachanda said announcing the formation of the new party before hundreds of cheering supporters. Leading political analyst Bipin Adhikari said the coming together of the Maoists with an “ultra left” past and the UML’s moderate stance was a “remarkable political development” in a country where the communists had split dozens of times since their movement was launched 70 years ago. “The unification of two communist parties as a very strong nationalist bloc will define the future of democracy and political stability,” Adhikari told Reuters. “How sustainable this (unity) will be remains to be seen,” he said referring to months of tough haggling between Prachanda and Oli for positions in the new party. Analysts said the unification would have regional implications as giants China and India jostle for influence with aid and investment in infrastructure like roads and hydroelectric power plants. “India has always remained concerned about the rise of Communist forces in Nepal. Now that a strong left party leads the government here, these concerns will only grow in future,” said Guna Raj Luintel, editor of the Nagarik daily. “On the other hand, China will be happy because the united party will be naturally closer to Beijing,” he said.